I love reading books, especially dystopia, sci-fi and (YA) fantasy. I also love graphic novels and comics. 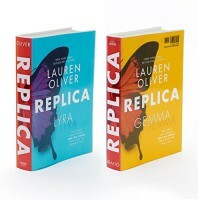 I’ve had mixed feelings about Lauren Oliver’s books in the past but I really liked the Delirium series and Replica intrigued me by its concept. If you have not heard about it, this is actually the story of two girls, Lyra and Gemma who do not know each other but who are going to meet at some point. The book is divided into two parts, you can start with Gemma’s or start with Lyra’s story, or read one chapter of each. The story was a bit intriguing but I was not that much into it. I started with Gemma’s story and had difficulties staying focused; it was a bit slow and not particularly interesting at the beginning. However, I was way more into Lyra’s story and wanted to know more about the Replicas and Haven. In the end, I enjoyed the concept of the book and the plot was great, but it did not blow my mind. Still, it was a good concept and the story was cool.